March 30 and 31, 2019. Registration is open. December 1 and 2, 2018. Guest instructor, Wayne Barton, joins the Chicago School of Woodworking to bring us this special opportunity. The essence of chip carving is simplicity and versatility. 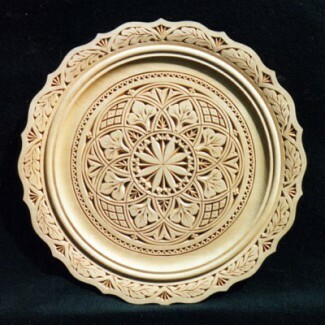 It is a decorative style of carving quickly and is easily learned. Simple in tool use and execution; versatile in design possibilities, application, and beauty; its name is derived from the carving process rather than the end product as in character carving or bird carving. In chip carving, precise cuts are incised into the wood forming chips of various geometric shape, size, and proportion. Wayne Barton is the preeminent American Chip Carver. Considered a master, he has won both national and international awards and recognition for his work. He has appeared on The American Woodshop with Scott Phillips and The Woodwright Shop with Roy Underhill. For “out-of-town” students, we recommend any hotel near O’Hare airport/Rosemont. I’m delighted you will be joining us in our up-coming beginning chip carving class. Bring any chip carving knives and sharpening stones you may have along with a small tee square with both metric and imperial increments, a bow compass and a mechanical .05 pencil preferably with a B grade lead. Not to fret, not to worry. There’s lots of time, we’re not in a hurry. You won’t have to go out shopping at the store. I’ll have everything you know you should. I have the answers, I know it all! Bring a notebook, and pencil. There will be a one hour break for lunch. You can bring a lunch, or eat out.